Google Analytics is fantastic but it can be really confusing! There are limitations to what Google Analytics can track and these limitations are definitely great sources of confusion! Let’s take a look. An Important Thing to Know that Google Analytics Cannot Do! One major limitation that affects some of the confusing terms we’ll go into below is that Google Analytics does not record you exiting a website. When you access a website, there is a log of this with a time stamp created, which indicates when you arrive at a website. But what happens when you close down your browser window when you’re finished browsing through a website? No log item can be created, so Analytics cannot report everything correctly. This affects some of our terms of confusion listed below! The session duration metric does not reflect not how long a visitor spends on your site. This is because Google Analytics doesn’t know when your visitor exits your site! When someone browses to your website, a new session is started. The session ends when there is 30 minutes of inactivity. Inactivity is when someone doesn’t view any other sites or when there isn’t an event that triggers an engagement. For example, if they play a video on your website this could be tracked as an engagement. Here’s an example of how sessions work. User A browses one page on your website and then leaves immediately. This is classed as one session and it is finished 30 minutes after the last engagement, which could be when the page was opened. User B browses your website and clicks on a link to visit another page. After this, they leave the site. 30 minutes of inactivity is calculated from the last engagement on the final page they visited. User C browses a website at 11.50 and there is no further activity on the site. The session ends at midnight. A bounce is when someone arrives on one page of a website and leaves from the exact same page, without visiting any other pages. Different websites’ bounce rates vary a lot, depending on the type of product or service you offer. If you have an e-commerce website, a high bounce rate on product pages is not good – this means most people didn’t click on the ‘buy’ button to move through the purchase process. On a blog, the bounce rate is typically quite high (above 70%) because people come to your website to read an article they’ve heard of and then they are likely to leave. The average time on page metrics are not actually the same as the average time users spend on a page. The statistic really means the average time on a page for people who didn’t bounce! Your visitor arrives on a page and leaves 60 seconds later. The average time for this page is not recorded because there is no way of recording when they exited. Your visitor arrives on page at 5pm and then clicks on a link to go to a different page at 5.05pm. The average time on the page is the difference between the time they landed on the first page and the time they went to the second page (i.e. 5 minutes). You can’t look at average time on pages in isolation. You need to look at your bounce rates, too. The metrics for the average time on your pages could be really high but, if your bounce rate is also really high, it means the statistics you get for the average time on your pages is based on a small percentage of your visitors. Google Analytics’ engagement rate can be described as the opposite measure to its bounce rate. You want to figure out how many pages people are visiting on your website. One major limitation of the engagement rate stats in Google Analytics is that it has no idea how long someone spends on a site if they bounce. Imagine someone visiting your website and spending 10 minutes reading your content. Then they leave. From an engagement point of view, Google considers this to be one page and puts it in the 0 to 10 seconds category (i.e the amount of time they spent on your site). If you have a high bounce rate, you will see that a lot of your visits are in the 0- to 10-second category. This is a useful term that is often ignored and is also easy to misunderstand. It means the number of visitors that exit from a particular page. Imagine you had a hotel booking site and you found that a high percentage of people exited your site on the booking page. That’s a key factor that you’d want to track, because it’s something you can work on and improve. This is normally explained as the traffic you get when people type in your website name into the browser. Your site is bookmarked and the visitor selects the bookmark. Direct traffic is like a bucket to put things in that don’t fit into other buckets. So, don’t think direct is just people typing in your website name. It could be one of several options. Google Analytics is great, but you need to understand the limitations of what it’s reporting. 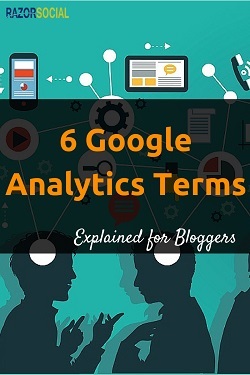 Which terms do you find confusing with Analytics?